Some background information starts with the tools for the task, which involves cigars and knives. “Cigars?" you ask. Before the Civil War, cigars became popular and that era’s entrepreneurs set up factories—about 1,500 or so, which employed about 5,000 people. When the cigar industry took off, what would follow but cigar boxes? The federal government got into the mix and set up some rules for aspects such as taxes and tax stamps; the type of tobacco used; and how to move the cigars. The crates and boxes used were lightweight and became more elaborate over time with art-inspired lid designs. The woods used were cedar and mahogany and people didn’t throw them away. This of course, provided a great craft supply for whittling. Many soldiers in the Civil War took up whittling to bide the time. Later, Civil War veterans took on migrant work and got involved with railroads, farms, ranches and construction sites. Those migrant farm laborers called hoe boys or hobos carried both their hoes and pocketknives. Some exchanged whittled pipes, whistles, walking sticks and figurines for food and shelter. It is also thought that German immigrants who traveled the country selling their wares created a trade for whittling. Whittling took on the name “folk art" because it was done by common people without an academic education in the arts. The tradition and art of carving was passed on to others and it made use of salvaged materials. The whittling knife changed as carving became popular and various shapes and angles facilitated the right cut. A basic blade will often cut in both the pull and push stroke. A proponent of design and interior decoration, Francis Lichten took classes at the Pennsylvania Academy of Fine Arts and traveled the countryside as an artist. Later, her knowledge led her to become the State Supervisor for the Index of American Design. She created a compilation of hundreds of sketches and design skills of the Pennsylvanian German population. Lichten coined the term Tramp Work; it appeared in the Pennsylvania Folk Life magazine in 1959. This name had nothing to do with the art form as a whole, but was a contemporary invention for art by men in every conceivable occupation. Early scholars were unable to pin a time, a figurehead or a school on Tramp Art. It was thought the art was created by the lower class, the poor, the unschooled or the displaced. There is a romantic notion of this art, and the idea that it was created as “Outsider Art" became part of its conventional mystique. Experts feel that Tramp Art was created mostly in a home setting and was made by men. The fact that it involves geometric shapes, regular symmetry and a layering and detail of such precise movements makes it hard to believe that it was created “on the go" so to speak. In the lexicon of Tramp Art are intricate designs such as rosettes, diamonds, geometric carvings and hearts—things that strangers just passing through may have not created. 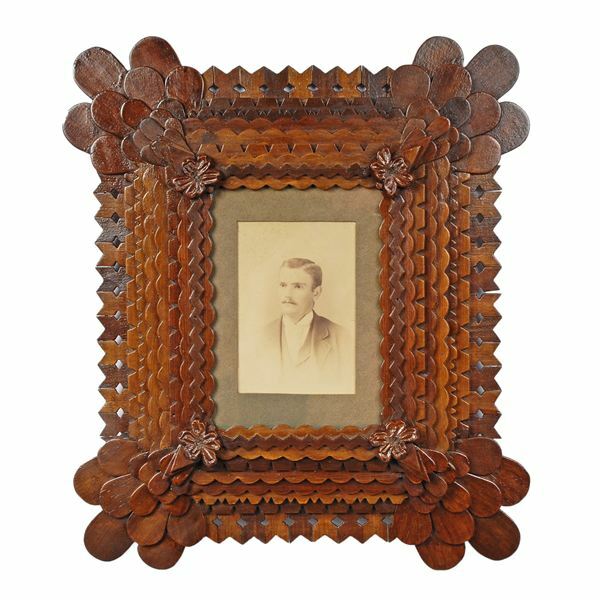 The craft is an assembling of layers of wood that add dimension; and carving on the outside edges makes for stunning frames, pockets and drawers. The art was used on clock cases, religious objects and ultimately, to decorate furniture. Important artists such as John Zubersky of the “Sunflower" fame or John Zadzora, who made expressive wall pockets, surely added their touch to the overall movement. Two important things remain: it was the art of everyman and no two pieces are identical. For collectors, these pieces however small are treasures. Tramp Art can be found in shows and flea markets and once you recognize it, you will continue to look for more. Collectors run the gambit from doctors, lawyers, presidents and many other hunter-collectors. You can snag a picture frame for $75 and boxes can go from a hundred dollars and up. Mirrors and furniture are pricey, and many dealers now sell them as antiques so the prices have gone up. Museums often feature folk art where Tramp Art can be seen. Religious pieces are frequently highlighted. Experts such as Clifford Wallach suggest that newbies look for framed boxes and things that are unusual but in good shape. He claims it is getting harder and harder to find the good stuff.